The quality of starting materials dramatically influences the properties of the final cellular product. For the development of applications involving cellular therapies, strict procedures according to GMP guidelines are mandatory. All materials used, such as antibodies, antigens, cytokines, cell culture bags, and cell culture media, must comply with GMP specifications. Invest in your clinical research by using from the very beginning. A seamless transition between basic and clinical research avoids revalidation and saves time. Watch the video to learn more about Miltenyi Biotec’s world-class GMP manufacturing facility at Teterow in Germany. Join Dr. Nicolas Danzenbächer and his webinar on Good Manufacturing Practice, explaining the guidelines in different countries and comparable regulations. Advanced integrated solutions to streamline cell processing workflows from sample preparation over cell separation, through cell culture to the final cellular product. MACS® GMP Products are manufactured and tested under a quality management system (ISO 13485) and are in compliance with relevant GMP guidelines. They are designed following the recommendations of USP <1043> on ancillary materials. Every processing step from development to production and quality control (QC) testing is extensively documented. 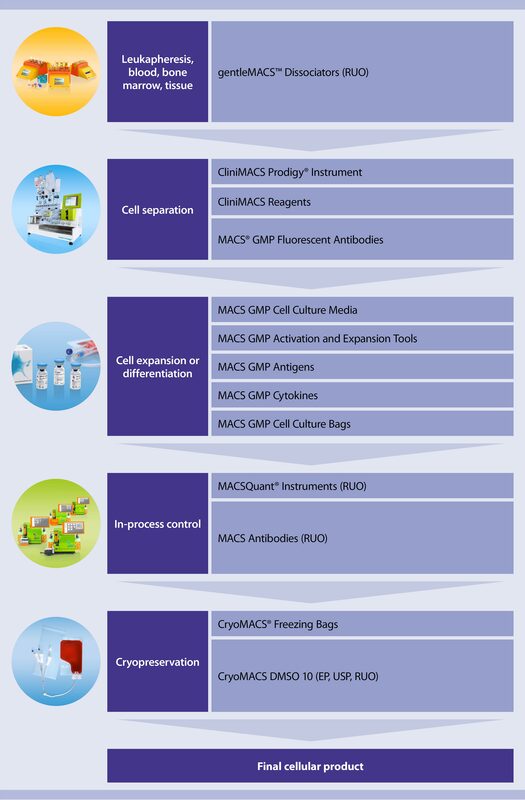 MACS GMP Products support the transition from research to clinic and help make cell therapies a clinical reality. Standardized and strictly controlled industrial manufacturing processes are followed, including automated aseptic filling, lyophilization, and finishing. All steps, from master cell banks to final filled products, are carried out on qualified equipment by qualified and skilled employees. As an experienced provider of products for regenerative medicine and tools for cell therapy applications, Miltenyi Biotec caters to our customers’ needs with technical and regulatory support and long-term perspectives. Miltenyi Biotec actively interacts with regulatory agencies and notified bodies. Please ask us about customized support for your clinical study. Miltenyi Biotec recognizes that product traceability is an important requirement for our customers. To fulfill the requirements, Miltenyi Biotec has established a certified ISO 13485 quality management system to achieve highest safety of our products with the lowest risk to our customers. MACS GMP Products are manufactured in qualified production facilities. Production processes at Miltenyi Biotec are developed to avoid the use of animal, human or viral components. Information and review regarding the origin of all materials used for the manufacturing of Miltenyi Biotec products is part of the release process of the raw material before using the components in manufacturing. The raw materials of MACS GMP labeled cell culture media are chemically defined, like e.g. salts, amino acids, fatty acids, Vitamins, buffers which are manufactured or isolated from defined sources and are not animal- or human derived, unless otherwise stated. If human serum albumin (HSA) is part of the MACS GMP cell culture media, this is specified in the data sheet of the product and can be downloaded from the home page of Miltenyi Biotec. Only well characterized licensed biologics from certified facilities that control the donor pool and appropriately screen the individual donors for relevant human infectious diseases are used in the production of MACS GMP cell culture media. No animal-derived components are used for manufacture of MACS GMP cell culture media. Raw materials for MACS GMP PepTivator products are synthetically prepared and do not contain animal-, human-derived materials. Raw materials of MACS GMP Cytokine products and MACS GMP T Cell TransAct are manufactured from defined sources and are not animal-, human-derived, unless otherwise stated. During production of recombinant proteins of microbial origin residual host-cell DNA and host cell proteins are reduced to the required limits. For the cultivation of microorganism in the up-stream process bovine milk derivatives of pharmaceutical grade may be used. Furthermore, recombinant enzymes especially developed for the biopharmaceutical production produced by fermentation with bovine milk derivatives may be used. According EMA/410/01 current Version milk derivatives are unlikely to present any risk of TSE contamination. The compliance with the note for guidance EMA/410/01 current Version for the manufacture of the used milk derivatives must be demonstrated by the supplier in the TSE/BSE certificate. Therefore, the risk of TSE/BSE possibly arising from this raw material is reduced to an utmost minimum. Miltenyi Biotec will specify the use of these raw materials on the CoO for the products in which these raw materials are used. The suppliers of raw materials and materials that are used in the course of production of MACS GMP products and get temporarily contact with the product are requested to provide information on the origin. If materials contain animal derived materials such as tallow, talcum or stearate based products, the certified suppliers have to State the compliance with the requirements of guidance EMA/410/01 current Version in the CoO or TSE/BSE statement. Therefore, no risk of the presence of causative agent of TSE has been identified. Several suppliers do only provide a TSE/BSE statement according to the note for guidance EMA/410/01 current Version but they do not provide a non-animal origin statement. Miltenyi Biotec will accept this TSE/BSE statement instead of CoO to release the raw material for manufacturing. A Miltenyi Biotec Certificate of Origin provides all necessary information about the product so customer can perform a TSE/BSE risk assessment based upon its intended use in their specific application. For the manufacture of MACS GMP monoclonal antibodies and antibody-based reagents (MACS GMP TransAct CD3/CD28 Kit, MACS GMP ExpAct Treg Kit, MACS GMP pure antibodies) monoclonal antibodies are derived from mammalian cell lines. Monoclonal antibodies are derivatives from animal tissue but do not contain high infectivity tissues according to the note for guidance EMA/410/01, current Version. Manufacturing process regarding virus removal and inactivation and viral safety testing according to the ICH Guidelines Q5A, Q5D and Q6B provide assurance that all viral contaminants are removed or inactivated. Therefore, no risk of the presence of causative agent of TSE has been identified. Furthermore, the used mammalian cell line is not retained in the final MACS GMP product. Miltenyi Biotec will declare for the MACS GMP products, that no animal- or human-derived components were used for the manufacture of this product, unless otherwise stated in the respective CoO. The information provided in this document is given to the best of our knowledge and belief, and is based on the information available at the time of this document was issued.